Lovable tearaway Tracy is back – and she’s starring in the school Christmas play! With her quick wits and cheeky personality, she’s got plenty to bring to the stage. But will Tracy be able to act sulky and grumpy enough to play the role of nasty Ebenezer Scrooge? And will her film-star mum make it back from Hollywood in time to watch Tracy’s starring role? One thing’s for sure – feisty, plucky Tracy will leave you wondering just what on earth she’ll do next! Really good and just as well written as every other Jacqueline Wilson book. I’d rate it 10 Tracey Beaker books out of ten Tracy Beaker books. I love the show so reading the book was even better because you get to really understand what is happening from Tracy’s point of view. It is a really good book but could be a bit better..
Just as amazing as the prequel. this is about a girl called tracy beaker who is in care and she tells her story about living in care. This is a great book to read it is very funny. This book was a totally cool, Active and also a exiting book to come home from school run up stairs straight into my room and read. Most people would take their books to school but I don’t because my point is that if you do you will not have nothing to look forward to when you come home But there is another reason why you could take your book to school is because if you do you could read it all at school and then come home to another great lively, adventurous book like Jacqueline Wilson Lilly Alone which is another get out there book. Hope you think the same because I think this book was one of the best ones which I read everyday and every night to get exited to. Verry nice book Tracy beaker acted Scrooge. She hates JUSTINE LITTLE WOOD!She dos not tell enyone about her mum. Her favourite colour is blood red she is 10 .She loves Camila her baby friend and likes her hair .She likes to eat everythink cake sweets pizza choclate sundays and strawberry sundays she likes to drink pints of bitter no shes just kiding she had a sip of it once but she did not like it . She scares weedy peeter and hes scared of every think! I love Tracy Beaker! Her character is so funny! A great book about when she stars in her Christmas school play. How silly-Tracy is so funny.I love Jackie Wilson. This book is really funny I loved it. It’s a good book though it is a shame that it is a short sample this book got me waning to read more!!!! Another Tracy Beaker. She will always be interesting. i love jaqueiline wilson so i love starring tracy beaker. I loved Starring Tracy Beaker, and all of the TB series. The characters are funny, and intersting, and I love how it is written in first person. The story lines were great, and I will have to read it again soon! Beaker’s back, better than ever – amazing and exciting! 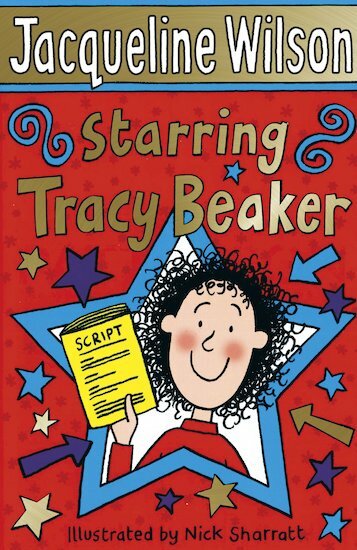 This fab book is about a girl called Tracy Beaker who lives in a childrens home, and is hoping that one day her mum will come and pick her up and take her to her star life. Well in this one Tracy gets the lead part in the christmas play… Great book! I like tracy beaker because she’s bossy, funny to see and always causes fights. When she thinks she can solve problems at the dumping ground, she only makes it worse. This book is 5 stars. Tracy’s always up to trouble! This book is really funny and interesting, with touching, funny and hillarious parts! Wow I loved this book!! I wouldn`t mind reading it again!! What I like about this book: The way Tracy writes it in her own words, and the way Tracy calls Justine new names like: Justine – Pain – In – The – Bum – Littlewood and Justine – Won’t – Mind – Her – Own – Buisness – Littlewood. It makes the story really funny and it makes you want to read the whole book in one go the way Tracy and (Jacqueline Wilson) has wrote it. It’s a real page turner and I would recomend it to both girls and boys! 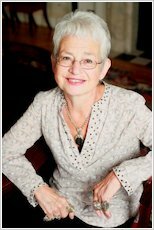 So, come on now, read this book from the most best author for children’s books – Jacqueline Wilson! She’s a brilliant writer! What a book girls and boys amazing the book i love! funny,clever JAQULINE WILSON HAD DONE IT AGAIN! I would rate this book 10/10 cause I loved it soooooooo much!!! I love the way the dumping ground have their own edition of A Christmas Carol! A really good book to read at Christmas time! Starring Tracy Beaker is a story to compare your thoughts and feelings and also to have your mind being absorbed by Tracy. This book from all others inspired me because I Ioved the characteristics of everyone [yes, even Justine Littlewood/ brain] and the themes of it were gr8! I rate this a big 10/10 and recommend it to everyone, all ages! I will definitely use the tips but I wont be violent like Tracy! This time it has a difference, with a Christmas play and Tracy’s secret lover, who is it? Is it Tracy’s mum, or will it be Cam? Find out by reading the wonderful book ever and I will guarantee you will never regret reading it! This book is brill i read it over and over again. This book is so cool and funny it is sad though that tracy really wants her mum though but she pulls through!!! I read thid book at first it was ok but when it got to the middle it started to get good i loved it. Starrin Tracy Beaker was really good. Everyone is doing a christmas play and its like you are actually watching the play. I Lve This Book.Majour. It Rocks. I Lve The Desription Plot And About evryThin Else Her Attitude 4 Lif Is Da Best! This is one of my favourite books. 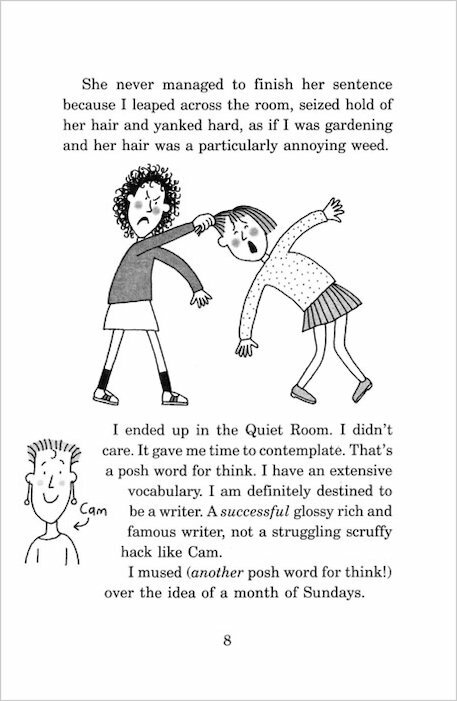 I really love Jacqueline Wilson books and this is one of the best because I like Tracy Beaker best of all her characters. Like in the other Tracy Beaker books, this is really, really funny and also really, really sad. 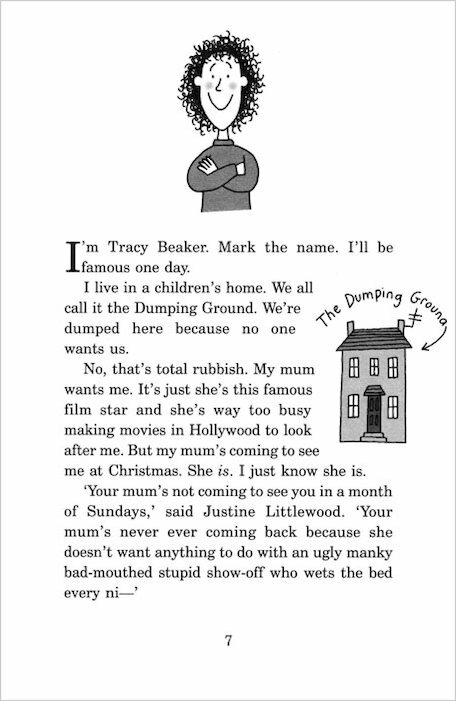 The funny bits are what Tracy does when she gets angry, and the sad bits are about her mum because Tracy keeps hoping her mum will come to see her at the Dumping Ground. I LOVE THIS BOOK !!! IT HAS EMOTION,LOVE AND ENEMIES IN IT. IT IS THE MOST FANTASTIC BOOK FOR ME !! !